Compare prices on car hire in Toulouse from all the major brands and find the best deals. When you book through us, unlimited mileage and insurance are always included in the price given. Toulouse is located just north of the Pyrénées – between the Mediterranean Sea and Atlantic Ocean, and is administrative center in the department Haute-Garonne (which is part of the region of Midi-Pyrenees). The city itself has a population of approx. 440,000, but one takes the entire metropolitan area, passing the 1 million. The economic and population expansion has been great for 2 World War II, primarily due to a strong focus on aircraft (Airbus) and high-tech industry. Toulouse is known as the “Pink City” (La Ville Rose) because most of the older buildings have been built in a distinctive type of pink brick. The town is situated by the river Garonne, which flows from the Pyrenees and into the Atlantic at Bordeaux. And nearby is the connection point between the Garonne and the Canal-du-Midi – the artificial waterway to the Mediterranean, which was filed as early as 1681 (and is a UNESCO World Heritage). 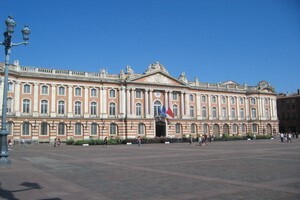 There are numerous sites of architectural and historic character of Toulouse. These include the 120-meter glory built Le Capitole from 1753 (the oldest parts are from the Middle Ages), which houses both the city’s Town Hall as the Opera Theatre du Capitole. Otherwise, there are several magnificent medieval churches – including Cathedral Saint-Etienne from the 1200s. Among the other sights, the following are mentioned: the Musée des Augustins from the 1400’s (a former monastery), a number of special museums and the Cité de l’Espace – which is a theme park for aerospace technology. Nearest Airport – Aéroport de Toulouse-Blagnac – located a few miles northwest of downtown.